There is a lot of incorrect information out there about dental health and your teeth. Unfortunately, believing some of this misleading information can cause you to make poor decisions regarding your oral hygiene. 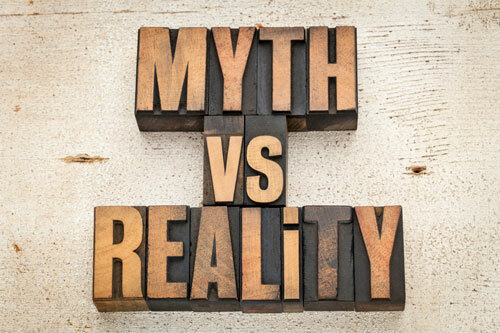 By putting some of the most common myths to bed, you can be a better advocate for your dental health. While your teeth might be white, this doesn't mean that they aren't plagued by cavities or infection. White teeth don't necessarily equate to healthy teeth. As we age, our teeth will naturally become more discolored, but this doesn't always mean that they are unhealthy or breaking down. Brushing is good for the teeth and the gums. If your gums are bleeding, it likely means that you are experiencing gingivitis, an early form of gum disease caused by plaque buildup. Unfortunately, the only way to get rid of this plaque is to brush and floss your teeth, and while the gums may bleed for a while, after the infection is cleared up and the gums get healthy again, this side effect will stop. Aspirin works when it is in the blood stream, and taking a dose orally can certainly help with pain relief. However, placing the tablet next to the tooth structure won't allow the medicine to enter the blood stream, as it won't be able to penetrate through the enamel to reach the nerve. Some women are under the impression that dental work can be harmful during pregnancy, but in reality, it is important to have regular dental checkups during this time. Pregnant women are especially susceptible to gingivitis and other dental problems, and meeting with your dentist periodically can help to prevent these issues before they arise. If you managed to make it through your childhood without a cavity, you should be proud of this accomplishment, but it doesn't mean that you can stop worrying about decay. There are a variety of things that can change now that you are an adult, and anything from the medication that you take to suffer from dry mouth can suddenly make you more prone to decay. For most people, dental checkups every six months will be appropriate. However, some people will require more frequent exams if they are at risk for disease. Your dentist will determine how often you should schedule your appointments. Choosing a hard toothbrush over a soft bristled option can be damaging to your teeth. It can result in the removal of enamel and possible abrasions. Soft toothbrushes can clean the teeth with less damage to the enamel when used properly. If you have bad breath, it doesn't mean that you need to make drastic changes to your dental hygiene. In some cases, it certainly might, but if you have been brushing and flossing appropriately but still deal with a foul mouth odor, there are other factors that you might want to consider. Your dietary choices are a major culprit, and illness and certain medications can also give you bad breath. If you notice that your bad breath is chronic, you should set up an appointment with your dentist to help determine the cause and possible remedies. Do you have more questions about your dental health? Call our office to set up an appointment.